Fox Soccer Plus is a premium TV channel in the U.S., which specializes in covering football, rugby and Australian football. This channel is owned by the Fox Entertainment Group, and is often used to broadcast overflow content to help Fox Sports 1 and Fox Sports 2 when there are several games taking place at the same time. This channel owns broadcasting rights for some of the top European club competitions, along with English cup games. 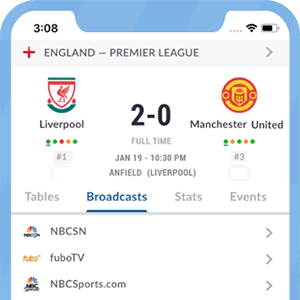 Fox Soccer Plus also owns broadcasting rights for the English National Football Teams (senior and underage), and added FIFA World Cup matches to its schedule in 2018. Where channel is Fox Soccer Plus on? Fox Soccer Plus is also available on most local cable TV suppliers in the U.S. Check your local listings for availability. *Got itLive Soccer TV does not provide Fox Soccer Plus live streaming. The information provided on this page is simply Fox Soccer Plus soccer TV schedule.